At Scottish Kilt Shop, your satisfaction is our number one priority. We work hard to ensure that our kilts are capable of not just meeting, but exceeding your expectations. Still, we know it's hard to trust the quality of a product when you're shopping online and not able to see or touch it for yourself. That's why we have instituted our 100% Satisfaction Love It or Burn It Guarantee! What Is the 100% Satisfaction Love It or Burn It Guarantee? We stand behind the quality of our kilts fully and that means that we won't ever make you pay for a kilt that doesn't meet your high standards. With our satisfaction guarantee, we'll refund your money fully if you're dissatisfied with the quality or appearance of your kilt. How Does the 100% Satisfaction Love It or Burn It Guarantee work? The 100% Satisfaction Love It or Burn It Guarantee couldn't be easier. If you don't love your kilt, all that you have to do is take it to a safe place and burn it. 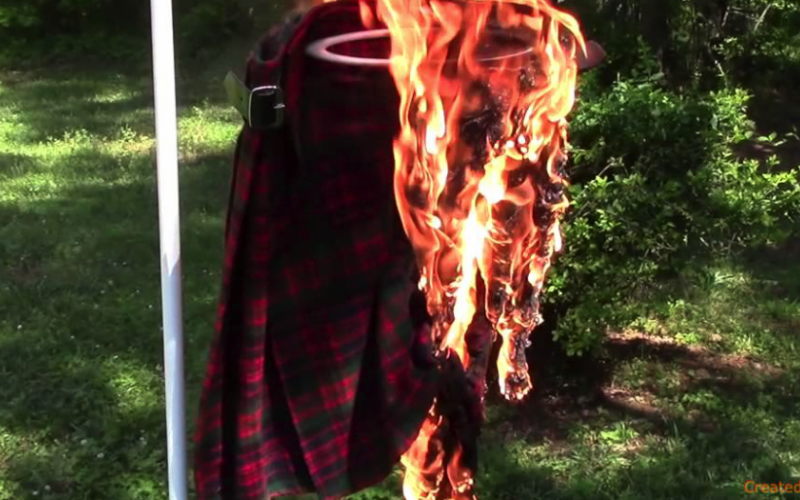 That's right--you light your kilt on fire, let it burn and take a video or picture of it. Send it to us via email at ADDRESS and we'll refund the full amount of your purchase right to your credit card. You'll only have to pay for the match to light it! What Does the 100% Satisfaction Love It or Burn It Guarantee cover? --your purchase qualifies for the 100% Satisfaction Love It or Burn It Guarantee. Is there anything that the 100% Satisfaction Love It or Burn It Guarantee doesn't cover? Our satisfaction guarantee is designed to give you confidence that you're purchasing a kilt that is of exceptional quality, so it covers all aspects of workmanship; however, because our kilts are made to measure and based on sizes that our customers provide, the guarantee does not apply for measuring issues. Please contact us if your kilt doesn’t fit properly for further guidance. We cannot provide satisfaction guarantee refunds. As a result, it's important that you take the time to carefully measure yourself or the person for whom you're shopping for prior to ordering. If you're not sure how to measure correctly, please contact us for assistance before you place your order, so that we can guide you through the process and help you get accurate measurements. How can I be sure my purchase qualifies for the 100% Satisfaction Love It or Burn It Guarantee?